After eight long years of living in the UK, I am FINALLY getting my Driver's License and looking to buy a car (insert the choir singing Hallelujah here)! I can't tell you how much I wish I had looked into getting my driver's license in this country when I first got here. I just found out that if I would have applied for it within the first 12 months, I could have just used my NJ driver's license to get my UK License without question or hassle, but because I didn’t, I am treated like a new driver which means I have to start with a learner’s permit and I have to take a written and driving test. 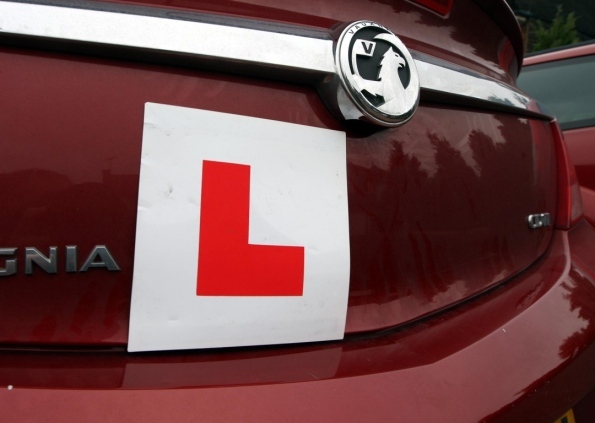 The learner’s permit costs £50.00. You apply for it and after 3 or 4 weeks, they send you a learner’s permit and ‘L plate’ which is a big red L that you have to stick on your car to practice driving (with a licensed driver) until you pass your test! How humiliating! I didn’t know it takes so long to get your permit, so when Ethan starts school, I won’t have my license for the first few weeks (or until I pass the tests), I will have to take a taxi to pick him up every day which will cost about £50 a week! Not much I can do about it now, but oh how I wish I looked into it when we first moved here! At least I would have had a license all this time! When we first moved here, we didn't think we were staying very long and because I didn't work, the expense of having a 2nd car wasn't a necessity (gas prices in the UK are extraordinary). I was also quite intimidated by the whole wrong side of the road, wrong side of the car thing (don't get me started on roundabouts) so in the beginning, I was ok with not driving here. Then I realized not having a car was like being a kid again and allowed very little freedom. For eight years, I have been walking almost everywhere I go. It was worse before Ethan was born because I had to walk no matter what the weather was. If I had to be somewhere and it was raining sideways outside, I got wet. It actually rains sideways more here more than it rains down and when that happens, forget about an umbrella. In my first few years here, I threw away A LOT of umbrellas. I used to say that the UK is where umbrellas go to die. It was the most infuriating thing when all you wanted to do was not get wet and after taking one step forward, your umbrella was inside out and snapped into bits! I once had a temper tantrum right there in the middle of the street, yelling and smashing the umbrella on the pavement before throwing it away and stomping off into the rain! After Ethan was born, I started taking taxis in bad weather because you can’t take a baby or small child out in the rain. This kept me dry, but it is a big expense in the rainy seasons. Ethan’s starts school next week and the school is too far to walk or take a taxi every day. It finally make more sense to have a car than not to!